Thompson and Mirabelli, SJ rivals, go 1-2 in javelin at USATF jrs.!!!!!! They’ve been battling since they were sophomores in high school, Thompson at Florence and Mirabelli just down Rte. 130 at Holy Cross. They’re still battling, and at the USATF Junior National Championships at Hayward Field in Eugene, Ore., long-time rivals Curtis Thompson and Chris Mirabelli finished first and second in the javelin, Thompson with a 237-4 bomb and Mirabelli with a throw of 225-5. Thompson recently finished his freshman year at Mississippi State and Mirabelli finished his first season at Rutgers. 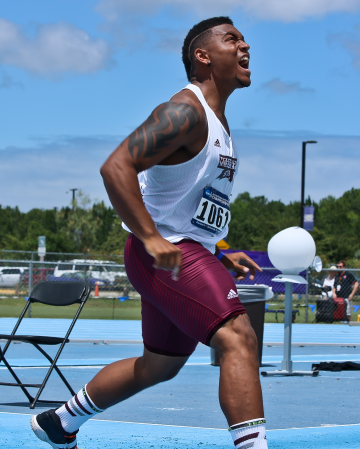 Thompson, who was third at NCAAs, also placed sixth in the senior men’s javelin event with a throw of 237-8. Thompson’s PR is a 248-1 at the SEC Championships, and Mirabelli’s is 227-6 from the Penn Relays. Zuidema’s career-best is a 207-5 at the Florida Relays.